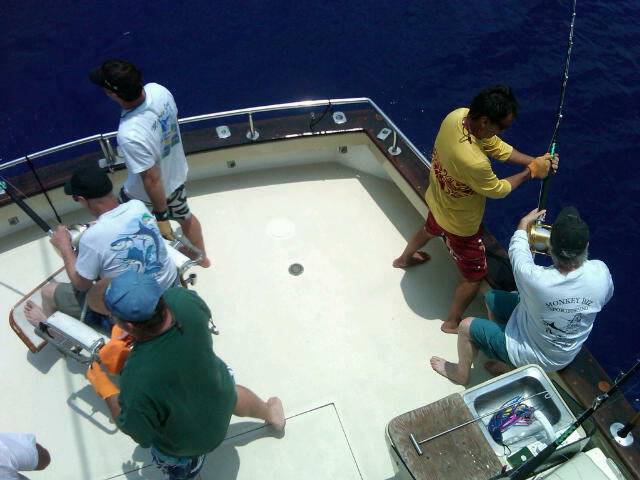 Captain Mike and the Maggie Joe crew hooked up 4 times during Day 4 of the Hawaiian International Billfish Tournament. 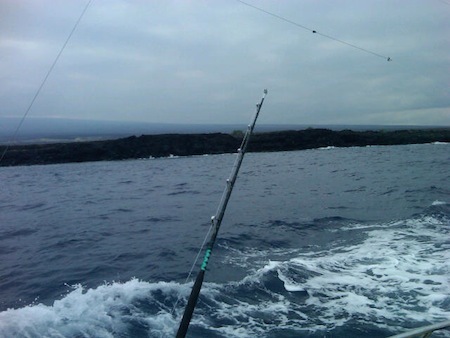 On board were anglers from the Kona Game and Fishing Club. 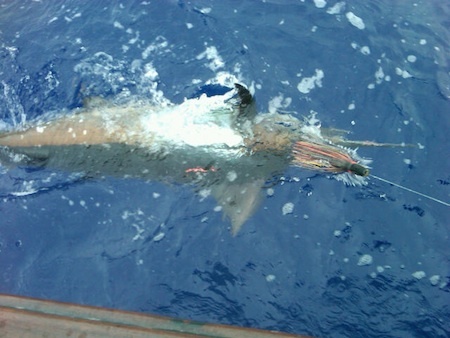 1 spearfish was caught and released while deep sea fishing off Kona, Hawaii, giving the guys some points for the day. With Day 5 starting tomorrow and Maggie Joe still in contention for the top boat, let’s all wish Captain Mike and the guys the best of luck! Phil in the fighting chair! 2nd Marlin tag and release of the day! Congratulations to Phil and the Maggie Joe crew as they tagged their second Blue Marlin of the day here in beautiful Kona, Hawaii. Maggie Joe, though based in Honolulu, Oahu at Kewalo Basin next to Waikiki, continues to excel in the waters off Kona, Hawaii. 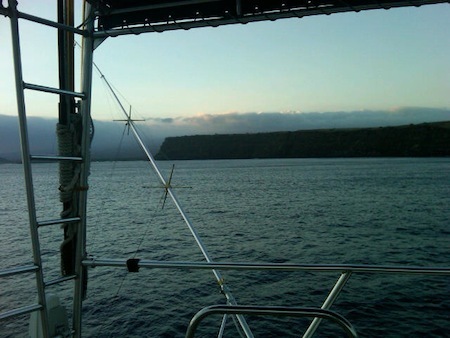 Captain Mike and crew are on a hot string themselves as they continue to haul in marlin after marlin during their sport fishing adventures off Kona, Hawaii. Tag and Release first marlin! Mahalo to Lowell for choosing Maggie Joe Sport Fishing. 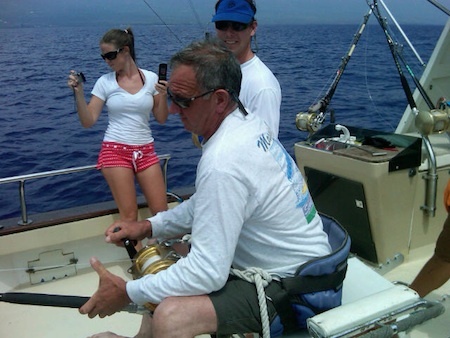 Lowell joined us for a day of deep sea fishing outside of Kona, Hawaii aboard the Maggie Joe. It was an action packed day as we saw a double marlin strike go off. 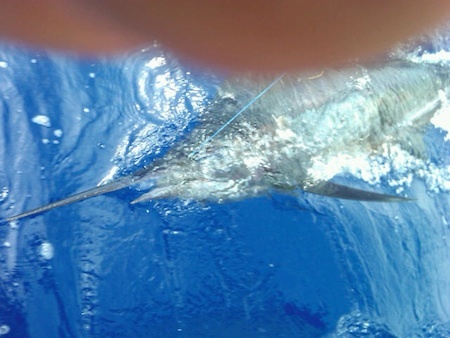 The first marlin came in and was tagged and released. The second marlin was hurt and it was taken aboard. 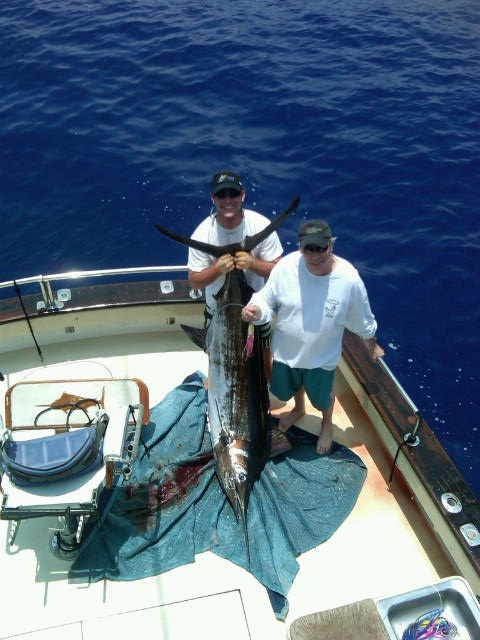 It was Lowell’s first marlin caught and we were happy he could do it with us. Aloha! 2nd Tag and Release Marlin of the Day aboard Maggie Joe! Captain Mike does it one more time! The Maggie Joe crew just hooked up, reeled in and then tagged and released this Blue Marlin, their second of the day. 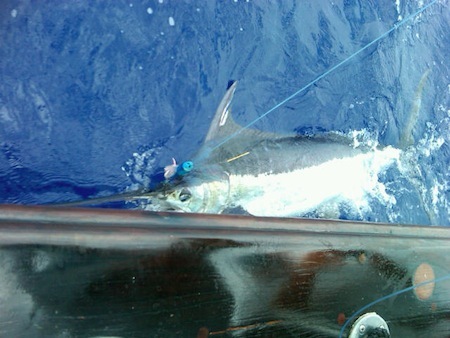 The photo was sent in by Captain Mike and the fish was caught while deep sea fishing outside of Kona, Hawaii! Great job guys! It’s the second day of the Skin’s Tournament in Kona, Hawaii and the Maggie Joe crew hooks up, reels in and then tags and releases an estimated 120 lb Blue Marlin. Deckie John reports some great video footage was taken of the fish jumping at the back deck and will be posted sometime tomorrow or the next day. Check back for updates and video footage. The Skin’s Tournament is a 3 day event, each day acting as an independent largest marlin-caught-winner-take all sport fishing tournament. Only marlin over 500 lbs. may be captured, all others are released, and the days purse money goes to the largest marlin boated. Good luck to the Maggie Joe crew as they search for a big ole grandma blue marlin off the Kona, Hawaii coast today and tomorrow. 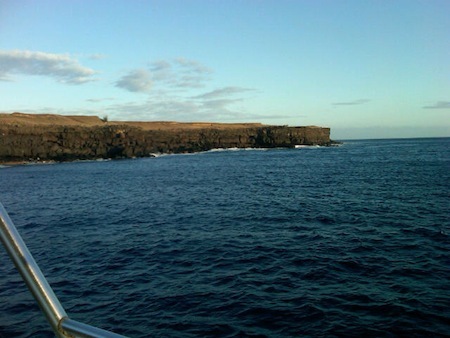 Maggie Joe has been spending the past few days right off South Point on the Big Island of Hawaii on an overnight sport fishing trip in between tournaments. Along with kicking back, relaxing and taking in the beautiful scenery they’ve gotten in some good fishing as they’ve had success hooking up with some Ono’s. 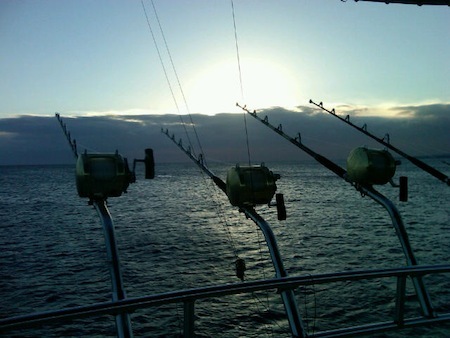 If you would be interested in a overnight fishing trip please give us a call at 1-877-806-3474! Aloha! Dave and Mike, Captain Matt’s father and uncle joined us aboard the Maggie Joe for another round of tournament warm up charters on 6/29/11. 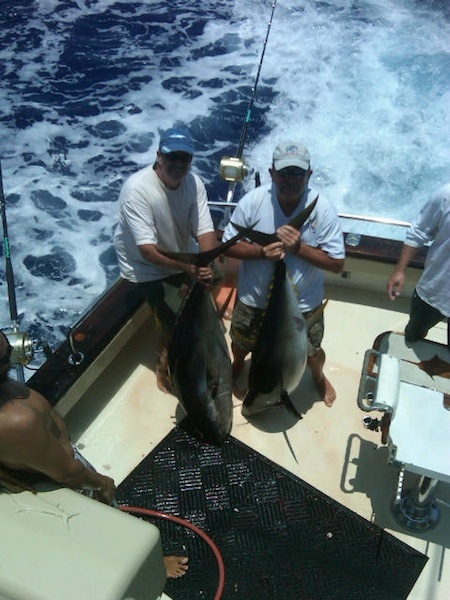 We’ve been having a blast with the guys as they both hauled in these nice Ahi’s off a double strike. 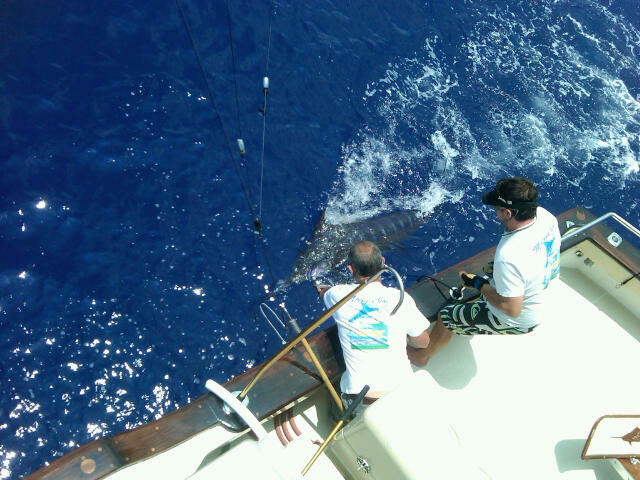 Earlier in the day an approximately 300 lb Blue Marlin was caught and released as well! We will photos to come. So far the fishing in Kona, Hawaii has been great and the Captain Mike and the rest of the Maggie Joe crew is geared up and ready for the Firecracker Tournament on July 2nd and 3rd. Aloha! Captain Mike and the Maggie Joe crew hooked up with this marlin off Kona, Hawaii in a warmup charter today before the Firecracker Tournament in Kona, Hawaii. Heather was in the fighting chair and did a great job reeling the fish in. The marlin is estimated to be 120 to 15o lbs. The marlin was tagged and released… hopefully we’ll find her again this weekend during the tournament when it counts! 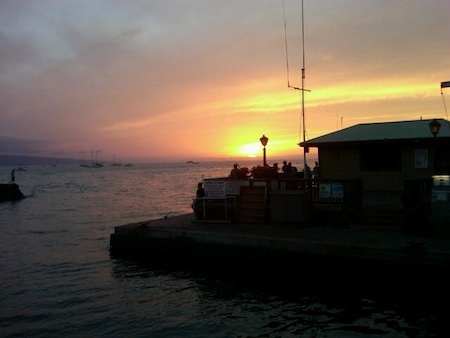 This was the scene last night as the Maggie Joe arrived at the harbor in Kona, Hawaii. Captain Mike took the photo while driving the Maggie Joe into Honokahau Harbor. 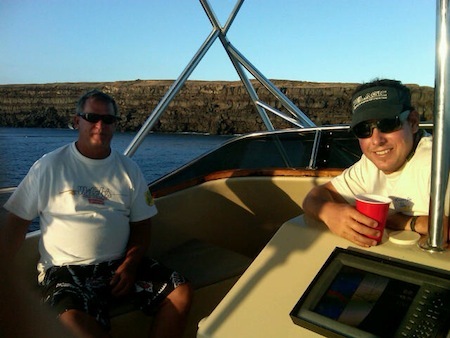 The crew will be getting settled this week in Kona as well as running a few private charters in preparation for the Firecracker Tournament (July 2nd and 3rd), the first of 3 tournaments the Maggie Joe will be participating in, during its stay on the Big Island. Let’s all wish Captain Mike and the rest of the Maggie Joe crew the best of luck! © 2011 Maggie Joe Sport Fishing. All rights reserved. Entries (RSS) and Comments (RSS).